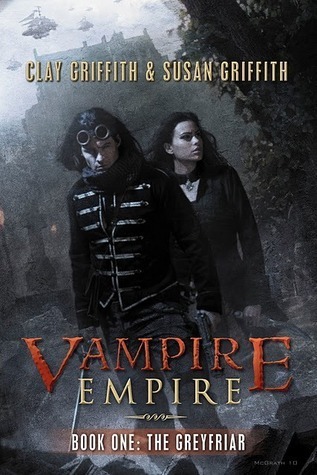 The Greyfriar (Vampire Empire #1) by Clay and Susan Griffith is one of the best books I've read thus far in 2011. It's one of those books where I keep going back to re-read my favorite parts again and again. It is a subtle novel. There is so much going on and such complex world building that it took me several chapters before I really connected with the characters or stories. But once I did, I was hooked. The Greyfriar vampires are just the kind of supernatural creatures I like. Unlike many novels which envisions vampires as hyper-sexualized creatures, the Greyfriar vampires are dark and violent, more like animals than humans. They do not interact with humans other than to feed or enslave them. Like almost all vampire legends, they are also extremeley intelligent and have a complex political and clan structure. As the book goes on, our opinion of vampires becomes more layered. Perhaps the barbaric views all humans hold of them is unjustified...or perhaps there are only a few very odd exceptions. Regardless, the authors hammer chips into Princess Adele's and the reader's preconceived notions. It took me awhile to warm to Adele, the main character. At first, she seems naive and spoiled, having lived a sheltered royal life. At the same time, I sensed an underlying wish to be someone, tempered by a strong sense of duty; she was willing to marry a strange, brash American Senator for the political needs of her kingdom. I admired her for being so selfless. However, she was closed - I didn't connect to her emotionally. This changes as the book goes on. Once Adele is captured by the vampires, we see the true Princess emerge. She is brave, passionate, stubborn, and loyal. She is slow to change, but also open minded enough to know what is good when she sees it. She truly is a heroine. Greyfriar was one of the best characters I've read in a long time. He starts out shrouded in mystery, for reasons that become clear soon enough. He is unbelievably brave. I loved the contrast between his gentle, kind nature and his capacity for extreme violence and vengeance. A complex character if there ever was one. The plot is fabulous. A mixture of suspenseful action scenes with a slow-building romance will satisfy readers of multiple genres. Adele goes from one dangerous situation to another. Interspersed with her death defying escapes are scenes laying out the complex political world in the Vampire Empire universe. The vampires are plotting, the Americans are plotting, the Equatorians are plotting, and even Adele's tutor has an underground political network. The political maneuvering is sure to become more involved as the series continues. Meanwhile, a sweet and surprisingly gentle romance grows between Adele and Greyfriar. There's no love at first sight in this novel. Rather there are shared experiences, both positive and negative, that create a romance out of trust, shared respect, and ultimately deep love. It was the romantic scenes that I went back to re-read. The Griffiths' prose does a fabulous job setting an atmosphere that feels dark and oppressive. Like a cloudy, humid day, you can almost feel the tension in the air. The writing is neither easy nor hard. The reader's eyes do not fly along the page - there are too many words on the page and none can legitimately be skipped - but the prose is steady and readable. I highly recommend The Greyfriar for anyone who loves (a) vampires, (b) darkness, (c) true romance, (d) fabulous world building, and (e) a terrific story. I've heard nothing but awesome things about this series! It's been on my TBR list forever, I need to read it! Yay! I absolutely adored this one:) Just like you, it took me a while to warm to Adele and to the world, but once she was with Greyfriar and then later with Gareth, I couldn't put it down. And that note at the end? I just about died:) Beautiful review Alison! Thanks for the review! I've heard about this book too and wasn't really sure. I've never read anything considered 'steampunk' and almost all the Vampire books I've read have been the 'friendly' variety. I'm for sure putting this on my TBR list. I'm not the biggest vampire fan, but this one sounds interesting.. bringing back vampires to what they were 'supposed' to be, perhaps. Also, mixing vampires and steampunk sounds quite cool! Proper vampires? Steampunk? Terrific story? I must read this. Thank you for the heads up! To be honest Steampunk is a new genre for me but after this review I know I'm going to have to check it out! I have heard nothing but good things about this book! I love all of the things you listed, and this one is getting moved up the TBR for sure! Thanks for the rec Alison! I feel like I just took a quiz and passed! A-E are definitely things I love in a vamp story, especially one that explores a different kind of vamp, more animalistic. Sounds kind of exciting. I bought this book a while back when I first started seeing reviews for it. I just had to have it. I can't believe I haven't read it yet. This review motivates me to do that soon. I loved this book! I had it on my Top 10 2010 list. I loved the unique take on the vampire genre.